As Seth Jordan describes his new brewing company, he leans against a whole pallet of Dog Tag beers in the Cardinal Distributing warehouse. The decorated chopper pilot from Afghanistan looks the part. Seth served nearly a decade in the Marine Corps as a UH-1Y “Huey” pilot. After 9/11, he felt obligated to serve his country so Seth left his dream job with ESPN in New York and joined the United States Marine Corps. He led over 200 combat missions and coordinated over 1,000 emergency aviation operations during his two tours to Helmand Province, Afghanistan. During his career, Seth served as an Instructor, Pilot, Forward Air Controller, Aviation Safety Officer and Public Affairs Officer. Seth’s personal military decorations include the Air Medal Strike/Flight Numeral 7, Navy and Marine Corps Commendation Medal, Navy and Marine Corps Achievement Medal with combat distinguishing device (“V”) with three gold stars (in lieu of fourth award), Combat Action Ribbon, Presidential Unit Citation, Navy Unit Commendation, Meritorious Unit Commendation, and the Humanitarian Service Medal. The Navy and Marine Corps Achievement Medal with “V” (for valor) was awarded for his valiant efforts to save fellow Marines the night that Camp Bastion was attacked by 15 Taliban insurgents in September of 2012. Seth and his squadron, HMLA 469 “Vengeance”, were also featured in Battleground Afghanistan, aired in 2013 on National Geographic, which looked inside the Afghan conflict through the eyes of American Marines on the front lines. His military experiences led him to look for a way to honor his friends who have died in the service of our country. Thinking about sitting around sharing stories with his military comrades over beers, he decided to honor them with a new beer brand. Dog Tag Brewing works with Gold Star families and details the stories of their fallen loved ones on each can. A portion of the proceeds are donated to charitable organizations selected by each family to honor every fallen warrior featured. Each family selects a different charity. Fisher House Foundation, Wounded Warrior Project, Our Military Kids and Warriors and Quiet Waters are examples of charities that are supported. 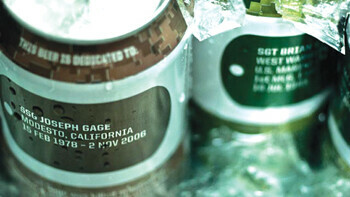 Dog Tag Brewing is the first beer company in America to utilize a new labeling technology that allows multiple can designs per batch, delivering a more interesting look for a can of beer. The blank cans have the individualized text etched out of the paint on them. Dog Tag uses this technique to tell the story of a fallen warrior on each can. Each can also shows which organization the families have decided to donate the proceeds to. Seth’s day job is at one of those organizations. Seth is the Executive Director of Warriors and Quiet Waters (WCW), a not for profit based right here in Bozeman. WCW’s mission is “to provide traumatically injured U.S. servicemen and women from Iraq and Afghanistan with a high quality restorative program, utilizing the therapeutic experience of fly fishing on Montana waters.” WQW has recently expanded their program to include skiing and equestrian experiences in an effort to serve more warriors wounded in conflicts abroad. The allure of mountains and streams was part of what drew Seth and Katy (Seth’s wife) to Montana. Katy settled in Belgrade to be closer to her sister during Seth’s last deployment. She fell in love with the Gallatin Valley and Seth joined her in 2012. After getting settled in Seth, Katy, and Emily Jordan (Seth’s sister) decided to launch Dog Tag Brewing, making the business a full family affair. Seth takes care of the business side of things, Emily is in charge of sales, and Katy is the Marketing Director. 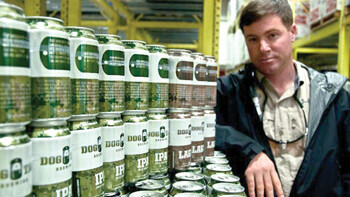 Dog Tag’s beers are being contract brewed in Milwaukee. Katy sees the brand as not restricted to military families. She sees it as a way for patriotic, red blooded Americans of all stripes to support the families of fallen warriors and enjoy a delicious beer all at the same time. It’s a way all of us can make a difference helping soldier’s families by doing what we normally do during the course of a weekend float or an afternoon party. And the beers are delicious. Dog Tag is launching with two different brews: a lager and an IPA. The lager is a pale malt brew, slightly darker and fuller bodied than most lagers on the market, which is nice. A good blend of hops and malt makes for a balanced, lighter beer. It is flavor forward on the front palate with a hint of hops on the back. The IPA continues the theme of balance with the high IBU count evened out by the right amount of malty sweetness. The dry-hopping process provides the beer with a very nice nose. The floral, citrus aromas stand out, making for an excellent, drinkable beer. The lager is great pairing for burgers and brats while the IPA is more suited to sitting and sipping. Dog Tag should start showing up in stores near you just in time for Memorial Day. I can’t imagine a better time for us to remember our brave men and women and help their families by hoisting a beer in their honor, especially a beer that helps the families of fallen soldiers. Next time you pick up a six-pack, think about making a conscious decision to buy Dog Tag beer and help our military families. Jack Zampolin is an avid reader, former professional cook, and is always interested in learning or experiencing something new. No one is in a hurry in Townshend’s Tea and the relaxing vibe is pervasive.